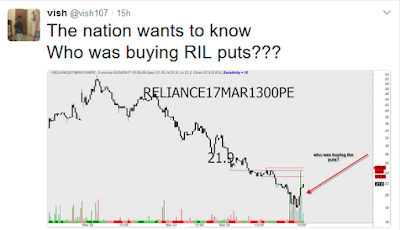 Why SEBI Banned Reliance Industries Ltd? The SEBI order, published on its website on March 24, 2017, says Reliance Industries and the 12 other entities violated provisions of Section 12A of the SEBI Act, 1992 and SEBI (Prohibition of Fraudulent and Unfair Trade Practices relating to the securities market) Regulations, 2003. SEBI has prohibited the 13 entities, including Reliance Industries, “from dealing in equity derivatives in the F&O segment of the stock exchange, directly or indirectly for a period of one year”, from the date of the order. Also SEBI has imposed a Rs 1,000-crore penalty on Reliance Industries Ltd., the largest in its over 20-year history. The regulator has also directed Reliance Industries to, to disgorge an amount of Rs 447.27 crore...along with interest calculated at the rate of 12 percent per annum from November 29, 2007 on wards, till the date of payment”. which could be approximately Rs 500 crore. 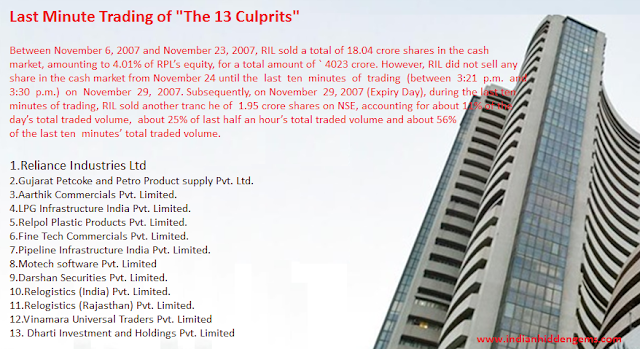 In March 2006, the Reliance Industries board decided to raise resources by selling 5 percent in Reliance Petroleum Ltd.
12 entities of RIL to take substantial short positions in November 2007 futures of Reliance Petroleum. The 12 entities together breached the client position limit allowed under the regulations. Total open interest positions in Reliance Petroleum reached 95 percent of overall market-wide position limits allowed for Reliance Petroleum in the derivatives market. The 12 entities together had 9.92 crore shares constituting 61.15 percent of the open interest in November futures. Reliance sold 18.04 crore Reliance Petroleum shares in the cash market between November 6 and 23 for Rs 4,023 crore. Reliance sold 1.95 crore Reliance Petroleum shares on the NSE on November 29, the last day of expiry, in the last 10 minutes of trade in the cash market. The sale of Reliance Petroleum shares in the last 10 minutes drove the stock to as low as Rs 209.80 per share. Reliance Petroleum November futures contracts settled at Rs 215.60 and the 12 entities gained on their short positions. The 12 entities together held short position of 7.97 crore share in Reliance Petroleum futures on the day of expiry. SEBI alleges Reliance and the 12 entities gained Rs 60.28 per share amounting to Rs 447.27 crore. Reliance, which wanted to dilute a nearly 5 percent stake in Reliance Petroleum , built short positions through the 12 entities in the futures market, to hedge any losses arising from a fall in the Reliance Petroleum stock when it sells shares in the cash market. Under SEBI’s regulation, any investor could have taken a maximum position of 1.09 crore shares in Reliance Petroleum futures. 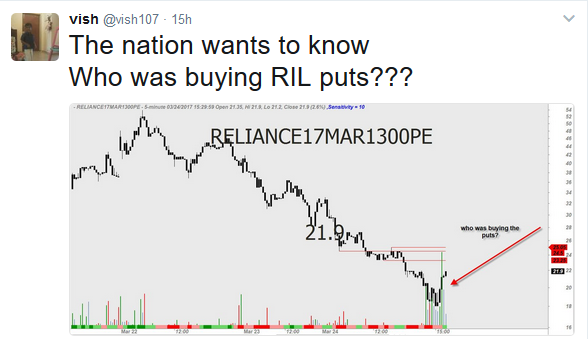 But the 12 entities related to Reliance together had nearly 7 times higher exposure to Reliance Petroleum futures. After Reliance sold over 18 crore shares in the cash, the 12 entities did not reduce their corresponding exposure in the futures market. SEBI alleges that this helped Reliance gain unlawfully on November 29, when it attempted to sell over 2 crore remainder Reliance Petroleum shares in the last 10 minutes of trade on the day of derivatives expiry. So What Happened on 24th March 2017?? Here is another one from vish, with a #NationWantsToKnow tagline. I am veteran of Capital Market with 33+ all-round experience, RIL as a Group is extremely notorious about "Insider Tradings & Collusive Market Manipulations" since the time of Dhiru BHAI Ambani !!! In India 99.9% Capital Market Operations are done by few notorious & criminal minded GANG of Brokers, but it is a GRAVE TRUTH that some of them NOW have BECOMES & KNOWN as DEEP VALUE INVESTORS + BANKERS + ENTREPRENEURS !!! They have combined NET-WORTH of 100+++ Billion Dollars (YES...Dollars)... ALL accumulated over just 25-30 year's span !!! In Your own words you have been in the capital market for 33 long years and must have been aware of insider and​ manipulating trading. 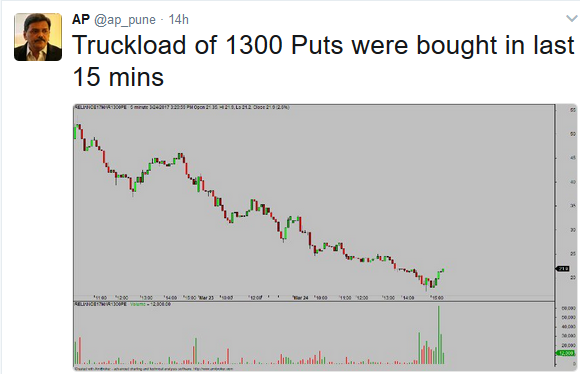 So why are you still in the market.You should have exited long ago with whatever profits you had made. Nobody is holding you down. In Your own words you have been in the capital market for 33 long years and must have been aware of insider and​ manipulating trading. So why are you still in the market.You should have exited long ago with whatever profits you had made. Nobody is holding you down""
Just see what happens to our Markets & INR Currency over next 2 - 3 quarter.... and then again post your wisdom for all to learn something from your wise & mature views !! !